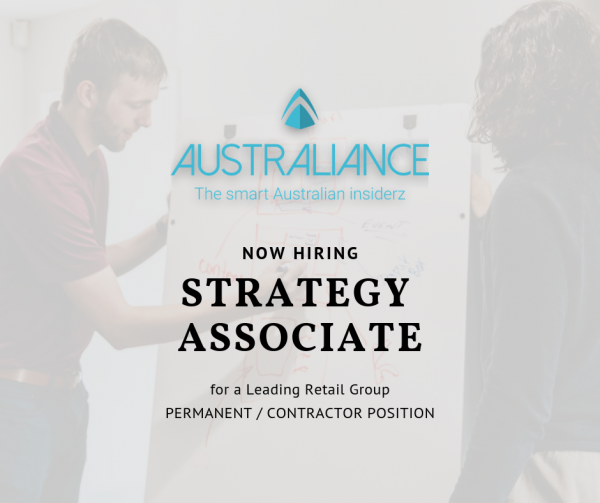 Australiance is looking for a Strategy Associate for a leading Australian Retail Group. Do not hesitate to apply if you are interested in this opportunity! An opportunity to make a visible difference to a ~A$60b business, developing the most critical strategic initiatives for one of the largest retail Business in Australia. Opportunity at Associate level for Junior Consultants of Top Tier Consulting firms with 2 years of experience. As Australia’s biggest retail group, our client has the most trusted food, liquor and general merchandise brands. With recent expansion into financial services and award­-winning multi­channel initiatives, their innovations and customer obsessions are changing the face of Australian retail. The corporate strategy team’s primary mandate is to develop high quality strategic initiatives for their businesses, or across the portfolio. They focus on areas which are outside « day job » and require additional resources to help think bigger, faster, better. Full time position available as soon as possible. Fill in our application form with the reference “Strategy Associate Retail 0419″. We will get back to you in under 24 hours (weekends excluded).